Torsion may be induced in a reinforced concrete member in various ways during the process of load transfer in a structural system. In reinforced concrete desi commonly used to refer to two different torsion -inducing situations. Torsion when encountered in reinforced concrete members usually occurs in combination with flexure shear. Torsion in its associated�pure?with metalformshafts) is(generallyrarelyencounteredinreinforced concrete. The interactive behavior of torsion with bending moment and flexural shear in reinforced concrete beams is fairly complex, owing to the no homogeneous, nonlinear and composite nature of the material and the presence of cracks. For convenience in design, codes prescribe highly simplified design procedures, which reflect a judicious blend of theoretical considerations and experimental results. 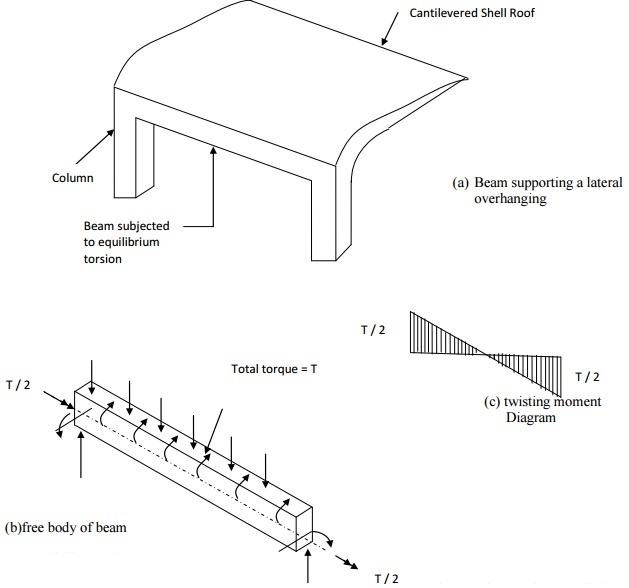 These design procedures and their bases are described in this chapter, following a brief review of the general behavior of reinforced concrete beams under torsion. in determining the twisting moments. In �compati angle of twist and the resulting twisting moment depends on the torsional stiffness of the member. In some (relatively rare) situations, axial force (tension or compression) may also be involved. There are some situations (such as circular beams supported on multiple columns) where both equilibrium torsion and compatibility torsion coexist. This is associated with twisting moments that are developed in a structural member is maintain static equilibrium with the external loads, and are independent of the torsional stiffness of the member. Such torsion must be necessarily considered design. The magnitude of the twisting moment does not depend on the torsional stiffness of the member, and is entirely determinable from statics alone. The member has to be designed for the full torsion, which is transmitted by the member to the supports. More ever, the end(s) of the member should be suitably restrained to enable the member to resist effectively the torsion induced. Typically, equilibrium torsion is induced in beams supporting lateral over hanging projections, and is caused by the eccentricity in the loading (Figure). Such torsion is also induced in beams curved plan and subjected to gravity loads, and in beams where the transverse loads are eccentric with respect to the shear centre of the cross -section. This is the name given to the type of torsion induced in a member rotations (twists) applied at one or more points along the length of the member. It twisting moments induced are directly dependent on the torsional stiffness of the member. These moments are generally statically in determine and their analysis necessarily involves (rotational) compatibility in the floor beam system has shown in figure,Bat th the end B. As the primary (Spandrel) beam ABC is monolithically connected with the secondary beam BD at the joint B., compatibilityB inatthespandrelBimpliesbeamABC,and a bendinganangl moment will develop at the end b of beam BD. The bending moment will be equal to, and will act in a direction opposite to the twisting moment, in orderBandthetwistingto/ sat bending moment at b depends on the torsional stiffness of beam ABC and the flexural stiffness of beam BD. In general, where the torsional resistance or stiffness of members has not been taken into account in the analysis of a structure no specific calculations for torsion will be necessary [CL40.1 of the code]. equal to that required to resist the �cracking t reinforcement specified by the code (CL. 25.5.1.6) is to ensure some degree of control of torsional cracking of beams due to compatibility torsion. torsional reinforcement should be provided for the calculated twisting moment.